Bookends for iOS (here called just Bookends unless a distinction with Bookends for Mac must be made) is reference management software for your iPad, iPhone, and iPad touch. You can use it as a standalone app, or pair it with Bookends for Mac, syncing the contents of your mobile and desktop devices via Apple’s iCloud Drive. 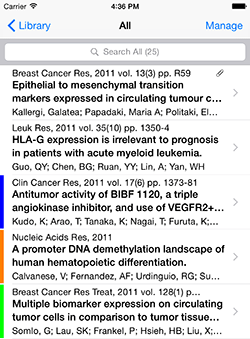 An unregistered version of Bookends for iOS is limited in the following ways: searches return a maximum of 20 references, only 50 references can be stored in your local database, PDFs that you annotate on the iOS device are watermarked, and you will see ads. To have full access without these restrictions and no ads you must purchase Full Version from within the app ("in-app purchase"). In addition, Bookends has an option for Pro Features Yearly, which at this time means Cloud Sync, multi-library support, and unlimited barcode scanning (details below). This can be bought with an in-app purchase as a yearly-renewable subscription. 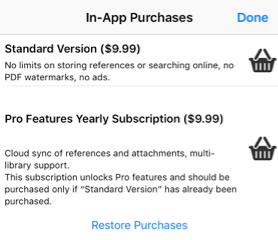 The subscription can be auto-renewable, and can be managed in iOS -> Settings > iTunes & App Store > Subscriptions. The subscription might renew if it isn’t canceled more than 24 hours before the renewal date. 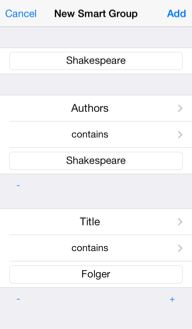 Bookends creates a library on your iOS device that contains references (or reference metadata, meaning details about the works such as the author, place of publication, etc.) and, optionally, attachments such as pdfs. •	Internet search and import. •	Sync with Bookends on the Mac. Many of the fields in the Unused range will have other labels, depending on the Type, such as Edition, Translator, ISSN/ISBN, DOI, PMID, and others appropriate for particular Types. The Types correspond to those in Bookends, and can be changed in Bookends only by syncing with Bookends. 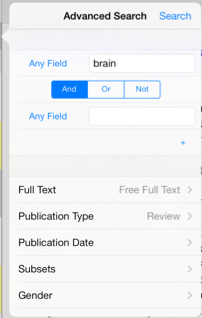 The factory default Type is Journal Article, but you can change this in Settings. You can organize your references into groups that you name and can quickly recall. Static groups contain references that you explicitly add. Smart groups contain references that meet criteria you specify (such as a word in the title, a keyword, a specific author, a date of publication, or all of the above), and the contents can change dynamically as references are added, deleted, or edited. Each group must have a unique name. Tapping on the top right button ("…”) will show a menu with actions. "Switch Local Library” should be used to change your current library to any that already exist, to create a new local library, or to download a new library from the cloud. 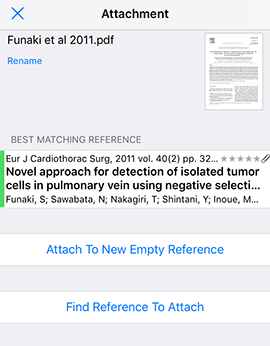 References are viewed in two ways: in a list or in abstract view. Note that for the iPad, if the orientation is horizontal you must tap the Library button at the top left to see the reference list. You can add additional fields to view in the abstract view in Settings. A summary of the metadata for each reference is listed. A (tappable) small paper clip appears on the right if the reference has one or more attachments. If you sync your library with Bookends, labels (applied in Bookends) will appear as a vertical bar of color to the left of the reference. 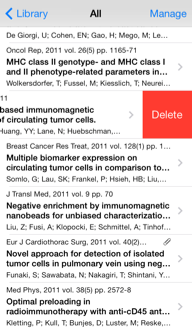 Tap the Manage button to delete (no limit) or email (limited to 20 at a time) multiple selected references at once. To see the abstract view, tap on the reference. To bypass the abstract display and see the attachment on the right, tap on the paper clip (if available). Author searches distinguish between first names and surname by the presence or absence of a comma: “E Jones” or “Jones, E”. Note that if you search for the initial of the first name, all authors with first names beginning with that letter will be found. At the bottom of the abstract you may see tappable links to the reference on-line (e.g. a PMID or DOI). 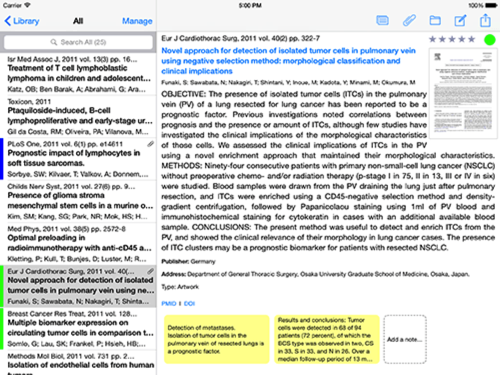 The abstract view lets you quickly access ratings, thumbnails of attached pdfs, and notes (notecards, shown in a note stream). Tap on the rating bullets/stars to add/edit the rating. Notecards are shown in yellow, and sync with Bookends notecards. Tap and hold on any note to enter the editing mode for all notes at once. Note text separated with 2 new lines will be split into separate notes. 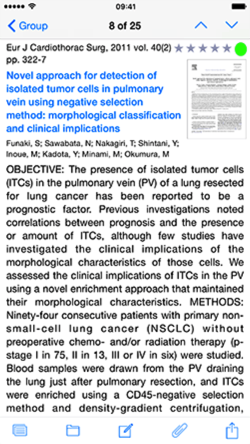 Tap on the pdf thumbnail to show the enlarged (normal) view of the pdf. Annotations made in Bookends will be shown in Bookends if “Use WebKit to display pdfs” is checked (in Bookends). 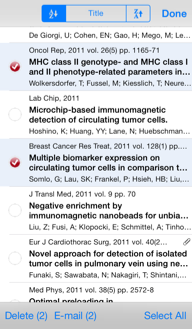 Citations can be created from the reference view via ‘Citation’ link or Open In menu (marked red in the screenshot). 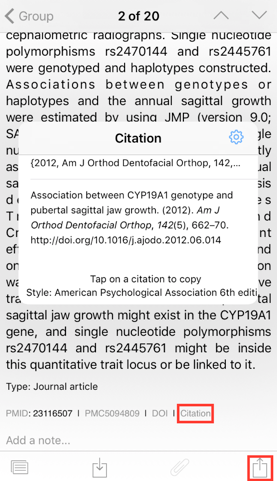 Tap on the kind of citation you want: temporary citation (to be used by Bookends for Mac when scanning) or the final citation. 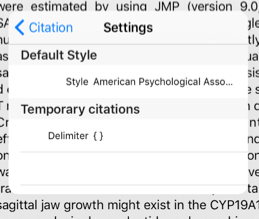 You can paste the copied citation into other apps, such as Word, Pages, or Mellel. 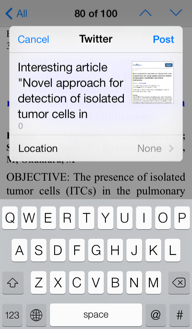 Tap the top example to copy the temporary citation, tap the bottom to copy the final citation. 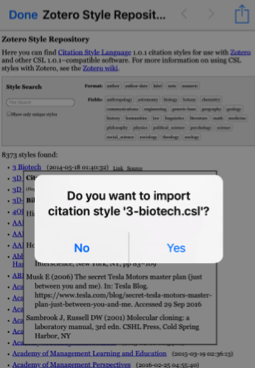 You can choose a default citation style from the styles list . 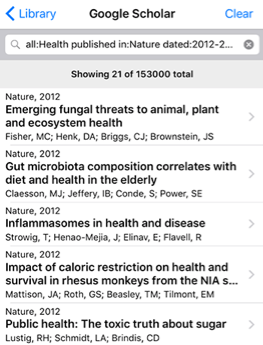 Tap on the “+” button to add more citation styles to the list. 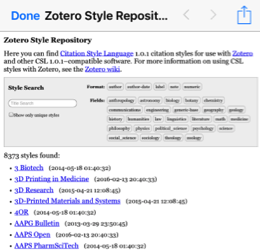 The Zotero Style Repository web page will be shown where you can tap on any style. The first tap on the style name will show a formatted example. Tap on the style name again and Bookends will ask you if you want to import this style. Note: CSL files, which contain the formatting instructions, can be imported from external sources like Safari or an email. 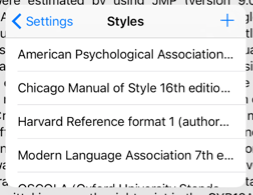 You can email a CSL file to yourself and after tapping on it, iOS will offer to open it in Bookends. 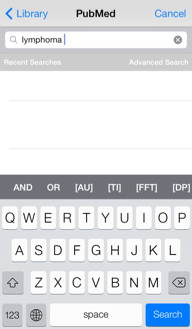 Regardless of which iOS device you are using, there will be a toolbar that lets you work with the reference. 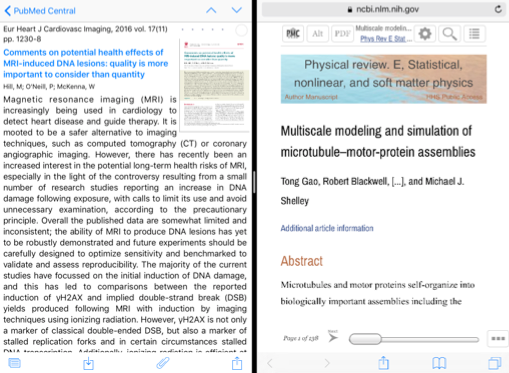 If the reference has a link to the article on the Web, tap this icon to open the browser view and access the Internet content (tap the Abstract icon to return to that view in Bookends). If you have access privileges, navigate to the pdf of the article (if available) and the paper clip icon (Download PDF) will become enabled. 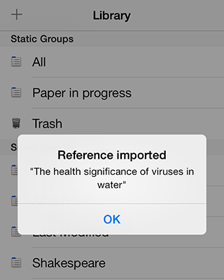 Note: neither the pdf nor the reference metadata will be imported to your library unless you tap the Import icon. 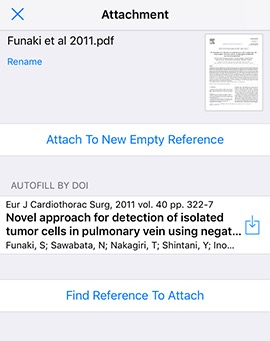 Tap the Import icon to import the reference (and pdf, if you downloaded it) into your personal library. You can import to a specific group by tapping and holding the Import button. A list of static groups will appear, and you can choose the one to which the new reference will be added. Note: Integration with 1Password: You can use the 1Password extension to fill in a login/password in the internal web browser. To use it, tap the Share icon and choose 1Password on a web page that requires a login/password. More information of how to setup and use 1Password can be found here: https://support.1password.com/1password-extension-ios/. 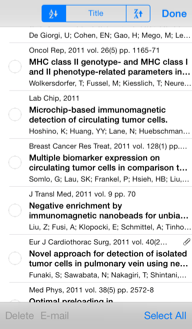 Tap Attachments to see the contents of attached files (typically pdfs). The image is disabled if the reference has no attachments. The pdf will open in full screen. Organize Groups lets you add or remove the reference from you static groups (including Trash). You cannot remove a reference from the group All (except by moving it to the Trash). 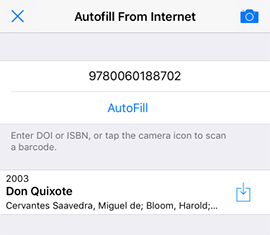 Tap the Share button to send the reference to one of several destinations or autofill references from the Internet by PMID, DOI, or ISBN. Tap Mail to send the reference to yourself or others. 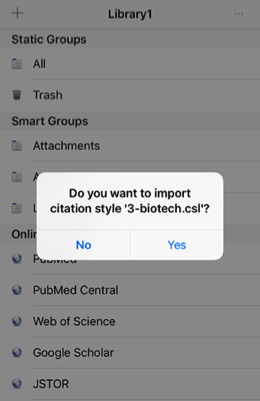 Note that the emailed text can be formatted for readability (formatted display) or tagged for importing into reference management applications like Bookends or EndNote (modified RIS)—configure this in Bookends Settings. If you have downloaded the pdf, you’ll have the option of sending that as well. You can send a tweet containing the title of the paper, prefixed with the text you entered in the Bookends Settings under Other (see section on Settings below). Tap the edit icon to allow manual editing of the reference’s contents. This is covered in the section Adding References and Groups Manually. To add items on the iOS device, use the + button. You can also add items by syncing with Bookends (see below). Tap this button to manually add references or groups to your Bookends library. This ensures that Bookends will not try to parse the name when it creates a bibliography. You can manage attachments, typically pdfs, here. 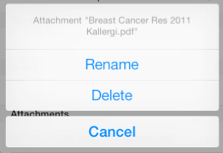 Tap on the name of an attachment and you’ll see an option to Rename or Delete it from your library. You will be prompted for the name of a static group. Adding and removing references from static groups is discussed below. You can edit the name of the static group by pressing the name for 1 second. 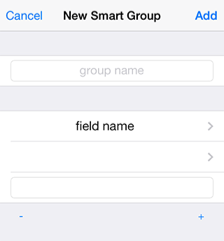 You can edit the name of the smart group and change search criteria by pressing the name for 1 second. 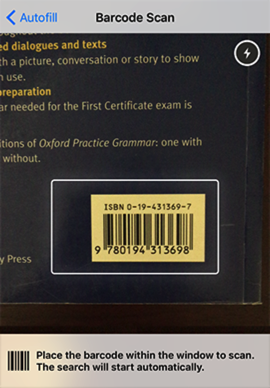 Enter a DOI or ISBN to search for these, or tap the camera icon to scan a barcode (requires Pro Features in-app purchase or else you can scan only one book per day). If the reference metadata is found online it will be displayed in the results section. Tap on the import icon to import the reference into the library. After import the reference will be displayed for editing. You can tap Done to end this session or tap the back arrow to perform another Autofill. 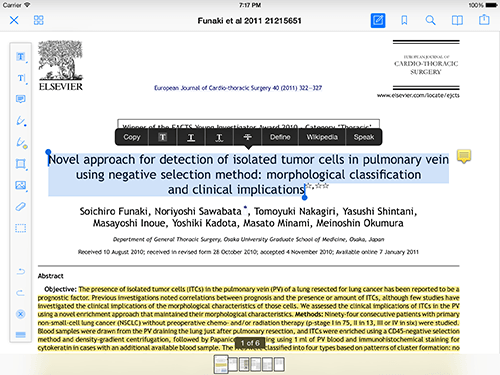 Bookends has built-in PDF annotation. If you prefer another app for this purpose, Bookends lets you export PDFs to other apps such as PDF Expert, PDF Viewer, GoodReader, iAnnotate, etc., where they can be read, annotated, and then exported back to Bookends. The PDF file can be moved between apps via the Share or Open In buttons. 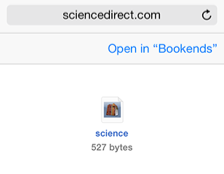 In Bookends, the Share button appears above a PDF you’re reading. When you tap on the Share icon you will be given the opportunity to email the PDF, open it in another app that handles PDFs, or print it. If it's a new file, Bookends will allow autofilling of reference metadata if the PDF contains a DOI (requires iOS 11+). You can also attach the PDF to another reference or a new reference. Swipe to the left and press the Delete button. Tap Manage, select the references you want to delete, and tap Delete. Note that when you delete a reference it is not actually removed from the library, it is placed in the Trash. You can tap on the Trash icon at any time and rescue or permanently delete any references it contains. There are two built-in static groups that you cannot alter: All and Trash. Tap on All to see a list of all references in your library. Tap on Trash to see any references you deleted. You can remove the reference from the Trash or permanently remove it from your library. Any static groups that you have created (or imported from Bookends) will appear in this list. 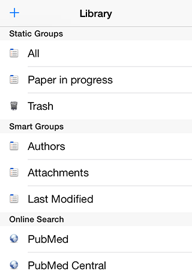 There are three built-in smart groups: Authors, Attachments, and Last Modified. 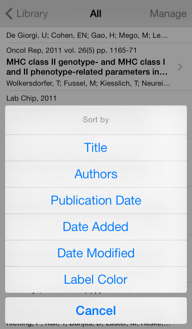 Tap on Authors to see a sorted list of each author found in the library. 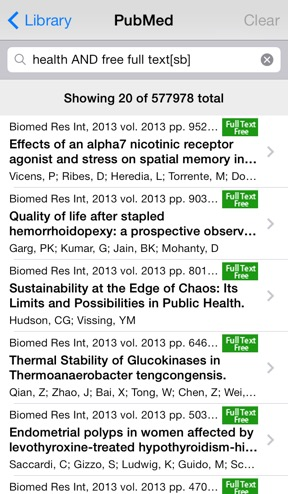 Tap on a name to see a list of all references authored by that person. Tap Attachments to see a list of all references that have one or more attachments. Any smart groups that you have created (or imported from Bookends for Mac) will appear in this list. Last Modified shows the last 25 references that have been added or edited. This includes references added or changed because of a sync with Bookends. You can sort the contents of a group by clicking on the Group name, then Edit. At the top of the screen is the field the groups are sorted by (in the example, Date Added). The direction of the sort (ascending or descending) is shown next to the name of the field, and you can change from one to the other by tapping. 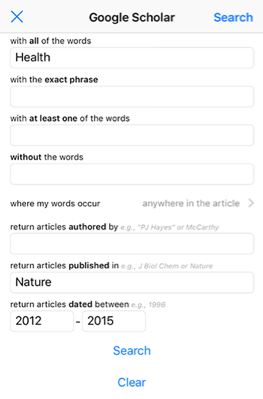 Tap on Advanced Search to construct a boolean (and, or, not) search and restrict the results by date of publication, publication type, the availability of full text, etc. The full reference view is displayed on the right. If you find a reference that you have already imported into your own library, it will be displayed in yellow. 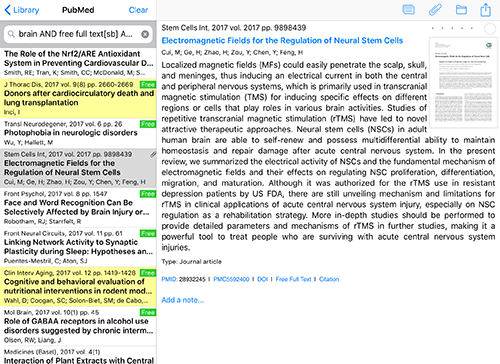 Bookends will display a badge that tells you if the article on PubMed is linked to the full text (HTML or a pdf), and if the full text is available for viewing at no cost (Free Full Text). Note that this information is supplied by PubMed and in some cases is incorrect. 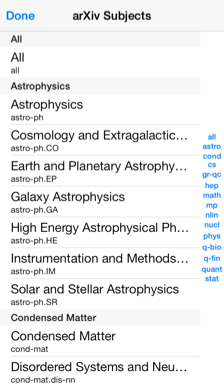 Use the fast typing bar to create advanced search queries that include boolean operators (AND, OR, NOT), specific arXiv searchable fields tags (ti, au, abs, co, etc. 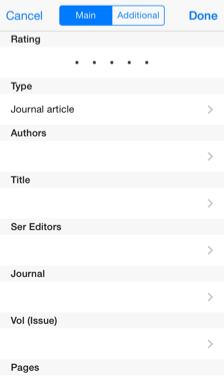 ), and/or limit your searches by subject by choosing any from the list of available subjects by tapping on “cat:all”. Use parentheses ‘( )’ to group boolean expressions and quote marks to search for an exact phrase. Set the default reference Type for manually-created references or imported references whose Type cannot be determined. If “Delete moves to Trash” is off, a deleted reference will be removed from the library immediately. If it is on, the reference will be moved to the Trash, from which it can be later recovered or permanently deleted. Tap + to add a field. Tap - to remove a field. 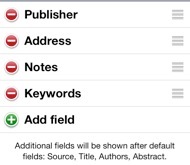 You cannot remove the default fields Source, Title, Authors, or Abstract. Drag the three-bar icon on the right to change the order in which the addition fields are shown. 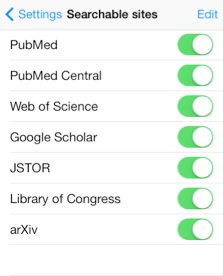 Searchable sites shows a list of all the search engines Bookends supports, and you can choose which ones you want shown (for example, if you work in the humanities, there may be no need to show PubMed). You can also reorder the list shown in Bookends by tapping the Edit button and dragging the three-bar icon on the right. In the PubMed settings, indicate if Bookends should check for full text, and how the returned list of references should be sorted (by date of addition to PubMed or date of publication). The number of references to retrieve with each pass (10, 20, 40, or 60). You can enter a default address for sending email. You can also tell Bookends to arrange the text in the email in a human readable form, or modified RIS (which can be imported into other reference management apps using their RIS filters). Bookends will replace the %@ with the URL of the web sites you use. If your library is very large, you may want to disable Live Search to avoid the delay that occurs whenever you enter a letter. If you disable Live Search, the search will only be performed when you press the Return key.Empty Library will remove all references, groups, and attachments from your library. This should be used with caution and cannot be undone. Autosync applies to Wi-Fi sync, not cloud sync. When Autosync is ON, Bookends for iOS syncs to Bookends for Mac without waiting for the confirm dialog in Bookends. If you have Autosync enabled and want to change options in the confirm dialog (e.g. 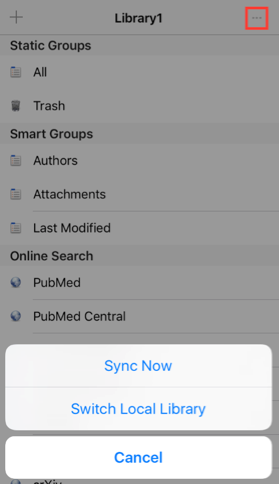 to sync particular groups rather than all references), turn Autosync OFF. After changing the settings in the Bookends confirm dialog and performing a sync, you can enable Autosync again in Bookends for iOS. Do Not Backup Attachments is used only for attachments stored locally, not for attachments that are synced to the iCloud folder during Cloud Sync. If you have a large number of attachments and don't want them being backed up by the system, turn this setting ON. Note that if you choose Do Not Back Up Attachments, on restoring your device from backup your attachments will be missing and should be downloaded from Bookends for Mac. Empty Library removes all data and attachments from the library in use and removes the attachments from the device. Attachments in the iCloud Drive folder (synced) will be undisturbed. The Twitter setting lets you tell Bookends what text should be used to prefix a tweet (e.g. “Interesting article”, “Look at this”, etc.). Note that these characters count towards the 140 limit.